“Improving the health and lives of people will remain at the core of our company’s mission and the recent discovery that our technology and intellectual property has implications across industries only broadens that commitment,” said Macauley Coggins, director of Scarborough Technologies. The company will also produce pioneering technologies that will not just create new technologies and improve existing ones, but also teach people how to maximize existing ones. “Technologies are exponentially changings how we work and live and that’s why education is at the core of our existence as a company,” said Coggins. “We think that presents challenges, as well as opportunities. We hope our technology can help people easily learn how to, for example, explore the world of genetics and quantum computing, to help them surmount those challenges and take advantage of those opportunities to improve their health and lives. According to Matt Swayne, marketing director for Scarborough Technologies, more information on these products will be coming soon. To learn more and keep up with those product announcements, please like our Facebook page and follow our blog. According to recent statistics, information technology budgets are increasing across the country, but experts say the healthcare IT spending, in particular, is spiking into double digits. Healthcare spending in big data, for example, is expected to grow 42 percent in 2019, according to Technavio. These increased tech budgets may be just the spark that ignites a conflagration in healthcare. Here are just a few ways technology will change healthcare. Currently, treatments are designed to treat not individuals, but massive populations of people for a few reasons. First, this is about as granular as medical research can go. Most of the keys to health -- the genome, for example -- are just starting to be explored and understood. Second, treating groups is economical. Creating a treatment for each person is too expensive. However, as bioengineers using machine learning and AI discover more about the human genome -- and how to manipulate it -- they will be able to tailor treatments to individuals and do so inexpensively. We are in the initial stages of a massive disruption in medical treatment. The days of doctors, surgeons, and other medical professionals being solely responsible for administering care are starting to fade. In the near future, patients will be able to monitor, assess, and adjust their own treatments with help from machines. They will also have unmatched access to their human medical helpers. The technology will also help doctors and their office workers connect with patients, according to HealthWorks Collective. “Search Health Hit says that an AI-powered business phone system for communication will also help improve the patient experience and satisfaction even when patients are at home.” -- HealthWorks Collective. With fitness apps and other wearables, AI will be a health professional that is on-duty 24-7. It can monitor fitness, rest, stress, and even sleep. Then, it can offer suggestions and recommendations. These interactions can happen anywhere at anytime -- at work, at home, at play, and even in the bed. As an example, a startup called Sweetch, uses AI to help predict, prevent and improve outcomes for people who have diabetes. The startup has recently partnered with WellSpan Health, a healthcare company to provide its mobile health app to the company’s 15,000 employees. With smart speakers with screens, like Amazon’s Echo Show, the doctor will be able to see you anytime. And, with AI using voice assistance and smart speakers, doctors may only be on call for more serious subjects. AI chatbots can handle much of the routine healthcare inquiries and appointments. But, it’s not just patients who will use smart speakers and smart screens. Doctors will be able to use them to set up appointments, learn new medical techniques on the fly, and reach out to patients and their office colleagues at any time and at any place. Finally, expect the information drowned in the massive bureaucracy that swallows patient data like a tsunami to finally recede. Blockchain technology will soon put the power of their data back into their own hands. People will be able to loan their data to research efforts, sell their data to pharmaceuticals, and offer their personal data across the healthcare enterprise instantly. Forms and long lines will be a thing of the past,many futurists predict. Healthcare is expensive, pulling needed income from the wallets and pocketbooks of people hoping to get well. Sickness also makes people less productive and drags them out of the workforce. The money invested in clinical trials for drug and treatment discovery is in the range of tens of billions of dollars each year, a figure that’s growing. If this continues, health experts set the global cost of healthcare at more than $18 trillion by 2040. That’s a huge drag on the economy. These figures don’t take the impact of technology into consideration, however. Technology may be able to make hospitals more efficient, take the often expensive guesswork out of treatment, and ease the strain on people’s budgets. As technology becomes increasingly cheaper, its impact on healthcare may become exponentially greater. Scarborough Biotechnology’s Snapshot is one example. It can perform robust genetic analysis for prices that small- to medium-sized biotech firms can afford. This puts genetic breakthroughs in the hands of more researchers. Artificial intelligence will soon give doctors advice in seconds on a patient’s conditions. It will be able to immediately serve up treatment recommendations. AI and machine learning tools will be able to provide aid that speeds recovery. When they patient goes home, expect technology to monitor and provide rehabilitation services. The recovery process for many diseases and operations will be reduced by weeks. How long will all of this happen? The answers vary. Some say months. Some years. Some say a decade. Most experts say, though, that you don’t have to wait. These things are happening right now. The healthcare revolution has arrived. It’s just not evenly distributed yet. Scarborough Biotechnology’s Snapshot is one of the first commercial in-silico models that currently models 92 genes, 53 reactions, 109 metabolites, 3 cellular compartments -- different parts within the cell -- and 7 diseases, a list, by the way, that is growing each day. 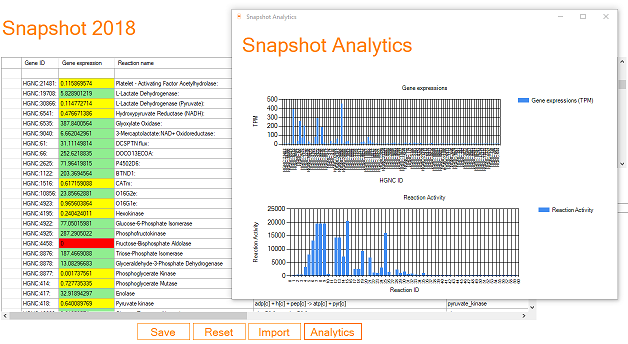 Rather than performing expensive, time-consuming experiments to analyse the effects of gene edits, Snapshot can accurately predict cellular functionality from real gene expression data so that users can see how their gene edits would affect cells almost instantly. You never want to introduce mistakes when you’re editing. You definitely never want to introduce mistakes when you’re performing genetic edits. With Snapshot, you can highlight potential genetic disorders based on genomic conditions to help users avoid making gene edits that may lead to such disorders. Pharmaceutical companies and research groups invest a lot of money in their drug candidates, but, how these drugs might cause side-effects are often unknown. Snapshot models certain drugs, such as painkillers -- like ibuprofen -- and antidepressants -- SSRIs, and their effects on metabolic pathways. To find out how genes affect the function of cells used to take a considerable investment. That puts it out of the hands of all but the biggest companies and research institutions. Snapshot, however, can provide a cheap model that allows anyone -- small groups, student labs, individuals, anyone! -- to explore how genes affect cellular functionality without having to buy any expensive equipment. To learn more about how Snapshot is disrupting genetic engineering, or, rather, how Snapshot can help YOU disrupt genetic engineering, see us at https://www.scarboroughbiotech.com/ or send us an email at support@scarboroughbiotech.com. In this demonstration I will show you how to model breast cancer from real gene expression data from breast cancer samples. Step 4: You will see that code has been loaded in to the code box from the dataset. Now just click Run. and that's it! Now you will see that reaction activity and metabolic flux has been predicted! With Snapshot we have recently released a function called realconv that can take gene expression data from patients and highlight potential diseases based upon that data. Imagine we have a patient whose symptoms include brown urine and rhabdomyolysis (breakdown of skeletal muscle). We obtain a gene expression profile from the patient from which we will see if there are any genetic conditions which maybe associated with the patients symptoms. 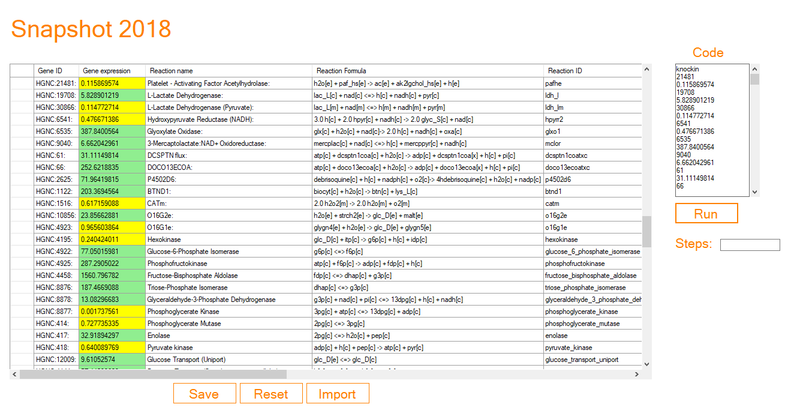 Then we can put the gene expression data in to snapshot. To do this we need to use the realconv function. This function takes gene expression values and will knockout any genes whose expression falls below a certain threashold value determined by the user. This value must be low such that it will turn off any genes whose expressions would be associated with an enzyme deficiency caused by that gene. In the code below we have set this value to 0.3 where 0 would be a complete knockdown of that gene and 1 would be normal expressions and anything higher would be determined to be overexpression. After we ahve determined the threshold we can start to add in the expressions of each gene from the expression profile. To add these expressions we must first declare the HGNC ID of that gene followed by it's expression on the next line below. From the disease table we can see that it has highlighted Exerctional Myglobinuria due to deficiency of HGNC 6535. However growing proteins in mamalian cells like CHO is challenging as they require optimal enviromental conditions to even produce a small amount of the desired protein. This is why recently the industry has looke towards genetic engineering to alter cell functionality in order to make these cells overproduce the target protein of interest. However altering a cells genome can be expensive and challenging requriing utting edge laboratories. Our genetic engineering program Snapshot which models the genes and reactions within cells could be a powerful tool for companies that want to edit a cells genome to produce proteins of interest. This is because snaptshot has built in functions that highlight genes associated with reactions that produce metabolites in different cellular compartments. For example if you wanted to find the genes associated with reactions that produce ATP then you would enter max:atp_c (where c denotes the cytoplasm compartment). This would then highlight all genes associated with producing ATP. Likewise if you wanted to minimise production of a certain metabolite that was deemed toxic or redundant then you would enter min:. 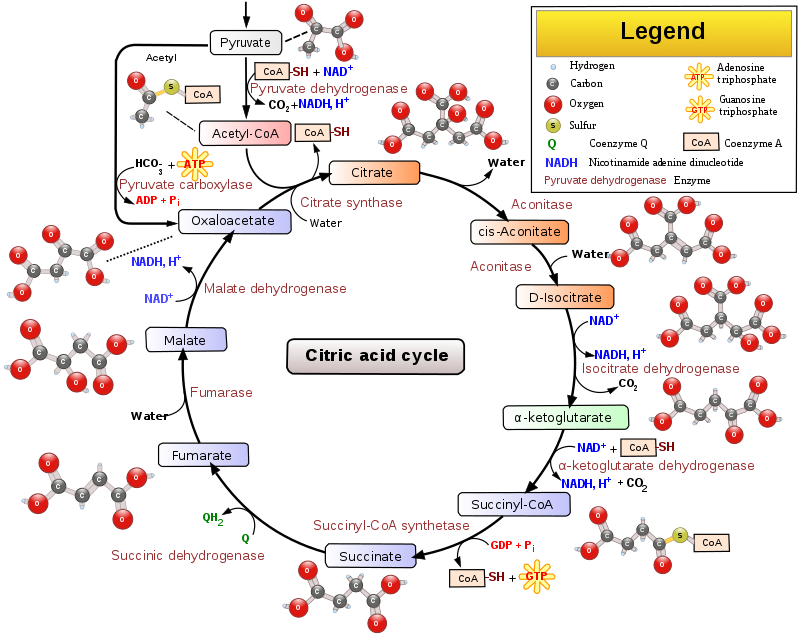 For example to minimise lactic_acid which is deemed a waste product you would enter min:l_lactic_acid_c.